Pakistan cricket team has drawn widespread derision after performing miserably in its first two matches of World Cup 2015. Many Pakistanis are understandably very angry at the top batting order that fell like flies to create a new world record of the loss of 4 wickets in the first few minutes of the match against West Indies with the score stuck at 1 run. While I agree with much of the criticism of the Pakistan cricket team for its poor performance seen so far, I do think the hysteria is unnecessary. All we have to do is to look at the history of Pakistan's performance in the 1992 World Cup which Pakistan won. Pakistan (173 runs) lost to India (216/7) by 43 runs. Pakistan (220/2) lost to West Indies (220/0) by 10 wickets. Pakistan (173/8) lost to South Africa (211/7) by 38 runs. Pakistan were bowled out by England for a meager 74 runs. Had luck not favored the Pakistanis with rain in England-Pakistan match, the "talented" 1992 players like Imran Khan, Wasim Akram and Javed Miandad would not have gone on to win the 1992 World Cup. Instead, they would have returned home defeated. Pakistan side remains as talented and resilient but unpredictable as ever. While the start of the 2015 World Cup is terrible for Pakistan's national team, it's too early to write them off. Let's hope Pakistan can still repeat the 1992 performance yet again. Steve: "That Pakistani team of 1992 was brilliant and had many very talented players"
The 1992 Pakistani team was subjected to very harsh criticism at the time for losing to India and West Indies. But we had Imran Khan, Wasim Akram, Mushtaq, Aaqib etc. Who do we have today? They were also young back then but were also extremely talented. The current team is spineless! Hasan: "But we had Imran Khan, Wasim Akram, Mushtaq, Aaqib etc. Who do we have today? They were also young back then but were also extremely talented. The current team is spineless!" Pakistan were bowled out by England for 74 runs. Had luck not favored them with the rain in England-Pakistan match, these "talented" 1992 players like Imran Khan, Wasim Akram, Javed Miandad, etc would not have gone on to win the 1992 World Cup. Instead, they'd come home defeated. fairly long. Pls go to the 25th min. Riaz, I agree with your analysis - let's bring back the '92 team out of retirement (sans Salim Malik) and we have a better chance than at present to win the cup. Umair: "Riaz, I agree with your analysis - let's bring back the '92 team out of retirement (sans Salim Malik) and we have a better chance than at present to win the cup"
You are doing prediction, so what ,could India Play in semi Final, or India will be Out in league. What do you think about Current Indian Team. Shekh: " What do you Think About Indian Team, Could they Win the ICC WC 2015"
Yes, India is looking very good and it can win the WC this year if it can beat Aus and NZ. After having been in Aus NZ region for a while and gotten a sound beating earlier on, it seems that India is finally acclimating and dominating WC matches now, as seen in their performance against Pakistan and West Indies. Are you predicting Pak will lose to SA also as it happened in 1992?? in that case Pak a very very little chance to reach QFbecause of NRR. KARACHI: Pakistan crushed India 11-0 on the final day of the 12th West Asian Baseball Cup to retain the title, with Iran and India securing second and third places respectively at the event which was held at the Pakistan Sports Board Complex in Islamabad. Pakistan’s Muhammad Sumair Zawar, Muhammad Jawad, Burhan Johar and Muhammad Ahsan Baig scored two home runs apiece while Zubair Nawaz, Muhammad Arsalan and Muhammad Waqas Ismail scored one each to guide Pakistan to their third straight victory in the tournament. Meanwhile, India captain Pankaj Chand said that although all games are played with an aim to win, their first priority was to thaw the oft-frosty relations between the two nations. “We came here with a message of peace and harmony, and I think we have achieved that,” said Chand. Iran defeated Iraq 18-4 to secure second place by winning two out of three matches. Iran’s Syed Batani and Syed Husnain scored three runs as Majid, Nima, Jalil, Yasir and Yasin contributed two, while Rajab and Majid Muhammadi scored one each. Iranian captain Kavan Rana said that while the environment in Islamabad was safe and secure, the crowd enthusiasm needs to be worked on. 1. 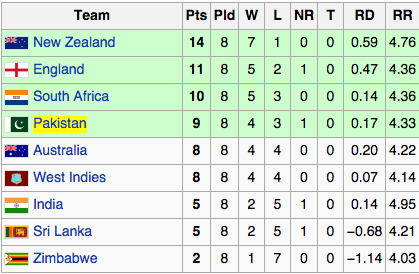 We will win our matches against UAE and Zimbabwe.... barely. 2. We will score 80 runs against South Africa in the first innings. And right when South Africa is about to finish the game in 5 overs the game will get rained out, and each team will get 1 point. 3. We will scrape a victory against Ireland, and qualify for the quarterfinal. After that we will play like cornered tigers and then beat India in the final to lift the cup! Pakistan's first win in 1992 World Cup was also against Zimbabwe? Pakistan 254/4 beat Zimbabwe 201/7 by 53 runs in Hobart. Skipper Misbah-ul-Haq's stubborn 73 and a fiery half-century from pace bowler Wahab Riaz helped the 1992 winners recover from 4-2 to reach 235-7. Brendan Taylor's 50 looked to have put Zimbabwe on course for a famous win. Riaz became the first Pakistani to score a fifty and take four wickets in the same World Cup match - and only the eighth cricketer to achieve the feat. And victory was important for Misbah's men, who, after heavy defeats by India and the West Indies, would have faced an uphill battle to progress to the quarter-finals had they lost again. "It was really tough because it was a make or break game for us," said the Pakistan captain. "You can't believe how happy we are because we were out of the tournament if we'd lost this game." Despite a backdrop of fierce criticism from the public and former players back home - and with chief selector Moin Khan forced to return from the World Cup after visiting a casino - Pakistan posted their highest score of the tournament so far, though their innings got off to a wretched start. But skipper Misbah played a vital innings, steadying the ship as wickets regularly fell around him - including two in one over when Williams dismissed Umar Akmal and Shahid Afridi in the space of three balls. Afridi, celebrating his 35th birthday, went for a duck. Only a late flurry from Riaz - his 54 coming from 55 balls - injected some urgency into the Pakistan innings and gave them a meaningful total to defend. did you watch the match or read the scorecard? Don't draw conclusions from the scoreboard. You will see that that match was a win game. Salman:" Don't draw conclusions from the scoreboard. You will see that that match was a win game"
Most people would have inked in Sarfraz Ahmed as Pakistan's wicketkeeper at the start of this tournament. They would have considered his three centuries and three further half-centuries in the latter half of 2014, scored at an extremely 21st-century scoring rate, and they would have concluded that he had probably earned enough selectorial patience to ride out a distinctly undisastrous run of middling scores in ODIs, which included some useful fast-scoring cameos, in the build-up to the World Cup. Then they would have considered the alternative - Umar Akmal, who, since August, had passed 15 just twice in ten ODI innings (a 46 and a 29), and whose name, incontrovertibly and with inescapable genetic foreboding, included the word "Akmal". Those people would all have been idiots. Pakistan's selectors have pulled off a masterstroke of counterintuitive selectorial wizardry. They know that nothing can boost a side more than a transformation in fortunes - their nation's victory from the precipice of elimination in 1992 bears testament to that. As many a panicking football manager will tell you on Transfer Deadline Day, one of the best ways of achieving such a transformation is to introduce high-class players to the team who can make a significant improvement. Sarfraz's recent performances proved beyond doubt that he was such a player. Therefore, he had to be left out. He had to sit on the sidelines whilst Pakistan's batsmen flunked and fumbled through their first few matches, and as Akmal spilled chances with familiar familial saucepan-handedness, as Nasir Jamshed, with a selfless heroism given to few, induced wicket-expectant complacency in Pakistan's opponents by scoring an almost negative amount of runs. With the two defeats against India and West Indies duly secured, and an unconvincing batting display against Zimbabwe having proved conclusively that Pakistan would be no threat to any of the stronger sides and were a lively candidate to be eliminated before the knockout stage, Sarfraz was introduced for the vital, must-win matches against South Africa and Ireland. A run-a-ball 49 against South Africa was highly influential in a low-scoring match; his six catches helped secure a momentum-shifting victory. Then his nerveless hundred of accumulative restraint made light work of the chase against the Irish (a game in which the now-gloveless Akmal took four catches in the field). How would Pakistan have achieved such tournament-shifting improvement without a player of Sarfraz's form and calibre to call upon? They would not. You might argue that they might not have been in such a mire in the first place, but that is none of anyone's business. Pakistan could not take that risk. They didn't need momentum for six weeks. They needed it for three. This has surely established a blueprint for all future tournaments in all sports. Leave out one of your key players, take yourself to the brink of failure, then use a morale-boosting recall to slingshot yourself away from your early-tournament ineptitude. Genius. Pure, unadulterated, sport-changing selectorial genius. The group stages peaked on March 7. Pakistan, needing a victory to maintain control of their destiny, defeated South Africa in a thrilling showdown that culminated in a newly invigorated pace attack steaming in to the world's finest batsman; then Ireland, also needing victory as a near-necessity rather than a pleasant incidental, rode some considerable donkeys of luck to hold off Zimbabwe in a thunderous classic of twists and controversy. 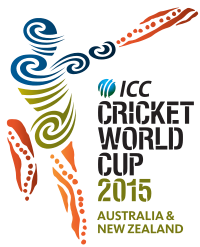 There were still eight days of cricket until the end of the preliminary part of the tournament, four of which only featured one match. Of the 12 games played, only England v Bangladesh and Ireland against Pakistan were of decisive importance. Eight of the other ten had no major relevance. Pakistani coach Waqar Younus: "Sarfaraz is not suitable for these (Aus, NZ) pitches". Winston Churchill (Paraphrased): "You can always count on Pakistanis to do the right thing – after they’ve tried everything else"
Kudos to Pakistani bowlers, especially Wahab Riaz, who bowled their hearts out to defend a paltry 213 score put on the board by Pak batsmen yesterday. Some of the observation are nothing sort of exaggeration,not about Pakistan but India's. Some of the Indian authors wrote that they never seen a world class road infrastructure in Delhi. That's load of crap. I lived in Delhi and the roads there especially in and around New Delhi are amazing,i am now living in Tokyo and can easily do a comparison to say roads are really good in New Delhi. Also it seems these authors has never traveled to any expressway which are of same standard as any first world highways.